Focus on comfort and practicality when designing your office space, considering layout, light, furniture, clutter and accessories. When it comes to office design, some companies try too hard to think outside the box or to emulate the likes of Google and in doing so, throw practicality out of the window. Wacky workspaces with unusual themes might get people talking about your business but will it help your employees work with fewer distractions? If it’s done properly it just might, but the design of your office is something you don’t want to have to re-do in a hurry, so think carefully before you commit to that ‘grass’ carpet. Comfort and practicality may not be exciting, but they are important to employees. When designing your office and thinking about the layout, make sure you consider how staff will talk to each other. Make sure employees who work closely together are located in the same part of your premises and aim to have both private and communal areas. If you don't have space for meeting rooms within your office, check whether there are any within your business centre. 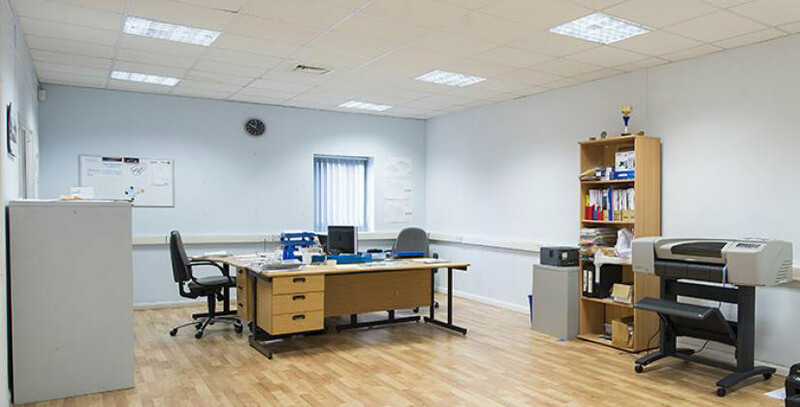 We have rooms that can be hired by the hour in the majority of our manned business centres. When selecting accommodation for your business, look at how much light it receives and whether there is enough space for everyone to comfortably carry out their jobs. People spend a large proportion of their lives at work, so it helps if it is a pleasant environment. Sufficient light also reduces the risk of eye strain and headaches. If your office doesn’t have much natural light, consider the right type of natural lighting can make the office seem less stark. As a general rule, you can never have too much light and space, but make sure you choose somewhere that sticks to your budget. We have a wide range of accommodation at affordable prices and because we don’t ask you to commit to a long-term fixed lease, you can change your unit if you find you suddenly need more or less space. Having an open plan office helps encourage staff to talk, bounce ideas off each other and work together. It can also help make your office a dynamic place to work. However, it does have its downsides. Don't try to cram people into less space to reduce your overheads. This can result in everyone can hear one else’s business and workers being disturbed by their neighbour's phone calls or noisy eating. Lack of privacy and quiet are two of the main bugbears with open plan office designs, so if you're ditching the cubicles, make sure there is a variety of communal and private space available for your staff. Employees need nice areas to rest and take breaks so they can return to their work feeling rejuvenated and energised. Encouraging employees who use computers to take screen breaks is important for their health and will help reduce absenteeism. If there is somewhere pleasant for people to eat their lunch it will mean less people end up eating a quick sandwich at their desk, which can lead to them feeling stressed, overworked and demoralised. Break-out areas are also ideal places to hold informal meetings so staff can exchange ideas. Many of our business centres have communal break-out areas for you to use. If yours doesn't, speak to your centre manager to see if one is being considered for the future. A tidy office will help people feel calm, organised and creative. Encouraging workers to eat away from their desk can help reduce the mess, as well as making sure everyone gets a well-earned break. Choosing your furniture wisely and making sure you have plenty of storage can help keep things organised. If you have items that don’t need to be kept in your office all the time, consider hiring storage to create more space in your work environment. We know how tight budgets are for many companies and it is tempting to try and save money wherever you can. But cheap, flimsy office furniture will not last long when it is being used by staff every day and can end up being a false. An uncomfortable office chair can cause discomfort and even back pain for your staff, which could result in higher levels of staff sickness. If your budget is tight, consider second-hand office furniture. Are you looking at traditional office furniture or considering a modern approach? With health and wellbeing in mind, some employers are choosing standing desks, which purportedly reduce many of the potential health issues that sitting can cause, including bad backs. Many workplaces have also moved away from each member of staff having a dedicated desk, instead opting for fluid spaces, which are more economical if many employees work flexibly across several locations. Letting staff bring in their favourite mugs, family photos and other personal items will help them feel more at home at work, boosting productivity. Allowing staff to personalise the way they work in the office will also benefit your company. Find out the different ways your employees like to work and make sure your office is fitted out with the right equipment. It is important that where you work reflects what you do as a company. Using your logo on items in the office or decorating it with your company colour scheme can make sure that your workplace feels like an integral part of your company. A bit of greenery can make an office feel more warm and inviting. Studies have also shown that office plants boost productivity, so surely that’s worth the effort of remembering to water them regularly?